Indian Prime Minister Narendra Modi flying to Pakistan to surprise Nawaz Sharif for his birthday on Christmas day is one thing. Keeping Indian journalists in office on a double shift is another. On Saturday morning, subscribers of the Times of India awoke to a headline that became its own news story. It reads, "After arriving in Kabul from Moscow, Modi calls Sharif to wish him Happy Birthday. Pak PM says, why don't you drop by since you'll be flying home over my country? Modi readily agrees". The headline-writer - clearly on a roll - didn't stop there. The kicker went on to fill in any gaps the headline may have left, in capitalised words. "In A Dramatically Spontaneous Gesture. NaMo Becomes First PM Since Vajpayee In 2004 To Visit Pak, Then Too Led By Sharif. Can His Unorthodox Brand Of Diplomacy Lead To Lasting Peace?" A quick Google search brings up this headline from the NY Post that - at 22 words - could possibly offer some competition. "Gospel singer suing McDonald's after she allegedly bit into piece of glass while eating chicken sandwich, which she claims ruined her voice." Not quite, though - especially since most other papers managed to convey their surprise in far fewer words. The Pioneer had, "PM TAKES INDIA, PAK BY STORM." Indian Express, in a rather clever pun, said "India meets Pakistan, Af-way." Mail Today went with, "FATHER OF ALL CHRISTMAS SURPRISES." Hindustan Times said "Lahore's surprise guest makes history." Economic Times had the clever, "Modi goes the Extra Mile in Search of Closer Ties." Twitter - outraged at this headline that was clearly intended to be a tweet - had a thing or two to say about it, and they brought their A-game to the subject. Who will make a list of all the tweets about that ToI headline, so we can give a prize to the funniest? 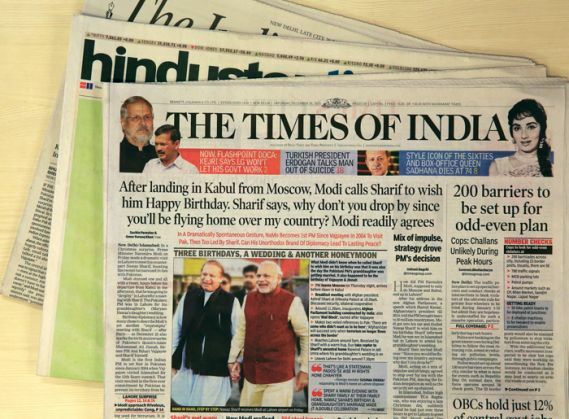 Is that a TOI headline in your pocket or are you just glad to see me? Whoever wrote that TOI headline hasn't signed up for Twitter yet.